A tunnel boring machine will lay thousands of feet of pipe underneath Hartford. Almost 4,000 feet of concrete pipe is being laid in Hartford, but you probably won’t notice it. 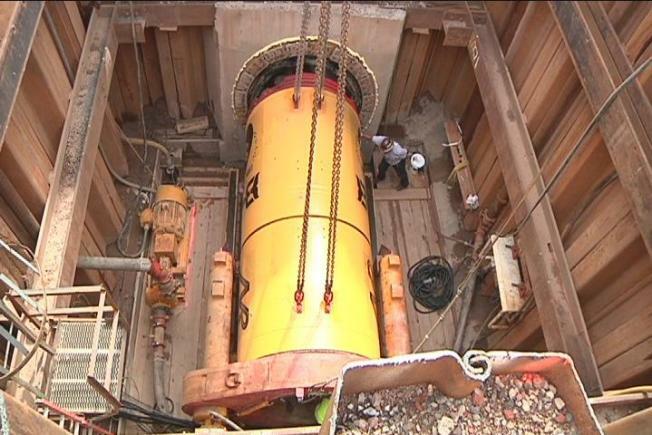 The Metropolitan District launched a new piece of equipment that will install the piping, completely underground. The machine is a tunnel boring machine and it moves underground, pulling the concrete pipe behind it. The machine is part of a $22.8 million project called the Homestead Avenue Interceptor Extension Project, which is designed to help alleviate flooding in Hartford. It is also the first major federally funded project in Hartford from the stimulus bill. Michael Mancini, the program design manager, said the tunnel boring machine will save the MDC a lot of money and the construction will not hinder people’s quality of life. “Traditionally, we would be having a big excavator here, cutting the road, opening it up and then putting in the pipe. Obviously, this is very noisy, it's disruptive, not only (to) traffic but (also to) the people who own property along here,” Mancini said.